If you have any questions, please contact us immediately so that we may resolve the issue for you. Suitable for cellphone below 6 inches, like iPhone X 8 7 6s 6 plus 5s 5 / Samsung Galaxy s7 s6 note 7 and etc. WATERPROOF Material: made by PU & PVC material; polyester material double thick inner pads, provide well SHACKPROOF for your phone when riding on rough road. 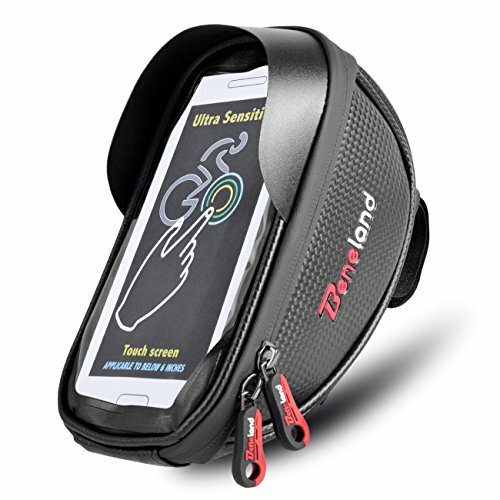 Sun VISOR & TPU touch screen: Sun Visor on the top helps you watch phone screen clearly even under strong sunlight. Sensitive touch screen window, you can easily hit functions on your phone and see the screen clearly through the transparent cover in any condition. Velcro strap design for quick release and installation, you can cut the Velcro strap length depend on your bike. If you have any questions about this product by Beneland, contact us by completing and submitting the form below. If you are looking for a specif part number, please include it with your message.